The Beautiful Things that Heaven Bears, by Dinaw Mengestu. Riverhead Books, 2007. The Beautiful Things that Heaven Bears has won several national and international awards, including the prestigious “first book” prize from The Guardian in 2007, and it has received very positive reviews from the American press such as the New York Times, Washington Post, and National Public Radio who all celebrate it as the first work of fiction about the Ethiopian immigrant experience in the United States. Its success is expected to inspire the next generation of immigrants from Africa to publish fiction, poetry, and memoir. The author, Dinaw Mengestu, came to America at the age of two. His father is part Oromo, part Amhara, and his name “Dinaw” is a made-up name meant to be “a bridge between the two cultures,” according to an interview with Abesha.com. The main character of his novel, Sepha Stephanos, is different from the author in that he fled Ethiopia at the age of seventeen after seeing his father beat up and abducted by the Derg regime. Sepha feels guilty for what happened to his father and misses his homeland, but at the same time, his mother, who still lives in Ethiopia, expects him to make a success of himself and achieve the American dream. Throughout the novel, Sepha struggles to reconcile the contradictory feelings he has about leaving Ethiopia and becoming American. Mengestu is a skillful artist who writes with wit and insight. Although the editors of Ogina find fault with the novel’s vague sense of history, its flat caricature of Ethiopian immigrant communities, and its lack of recognition for any of the ethnic groups from that region (e.g., Oromo, Afar, Somali, Sidamo, etc. ), we are very impressed with his portrait of a listless and frustrated man “stuck between two worlds.” The novel is as delightfully humorous as it is profoundly touching. Most readers of Ogina will recognize Mengestu’s fictional character Sepha Stephanos. He might remind you of someone you know. He is a middle-aged man who emigrated during the Red Terror when he was a young man. When he first arrived in America as a refugee, he lived for a short time with his uncle in an apartment building in Silver Spring, Maryland – a suburb of Washington D.C., a town famous for its large communities of Ethiopians. The building is almost entirely full of Habesha. His uncle, who had been a prosperous lawyer in his homeland, now works in the United States as a taxi driver and as a parking attendant. For a short time, Sepha worked as a bellhop in a hotel, but after two years, he felt increasingly alienated from this tightly knit Ethiopian community in his uncle’s apartment building because of its insularity and the oppressiveness of its false nostalgia for the time before the Revolution. So, hoping to achieve some personal success, he left that community to open up a small convenience store by himself in the mostly African-American neighborhood of Logan Circle in downtown Washington D.C. The novel begins more than a decade after he opened his store when a white woman named Judith and her biracial daughter named Naomi move in to the house next door. Judith is a history professor recently divorced from her African husband who is an economics professor. Their presence in Logan Circle signifies the beginning of gentrification that will transform the neighborhood’s economy and force many of its residents to move. As Judith’s daughter spends more and more time in Sepha’s store, they begin to form a friendship. The plot of the novel centers on Sepha’s faltering, semi-romantic relationship with Judith. The chapters bounce back and forth among three moments in time – (1) the autumn and early winter when he first meets Judith, (2) the following spring after Judith has left and Sepha appears to have given up on making a life for himself, and (3) his horrible memory of his father being beaten up by soldiers before his eyes. Through this story of a touchingly unsuccessful romance, the novel explores several themes of the immigrant experience: the painful transition from being a refugee to making a life in a new country, the paradoxes of the American dream, the politics of gentrification, and the contradictory longings – the longing to return to one’s homeland and the longing to forget one’s past entirely and immerse oneself in the capitalist, consumer culture of the United States. Mengestu writes with a brilliant and biting sense of humor that exposes the hypocrisies and paradoxes of both American culture in general and the African immigrant culture in particular. 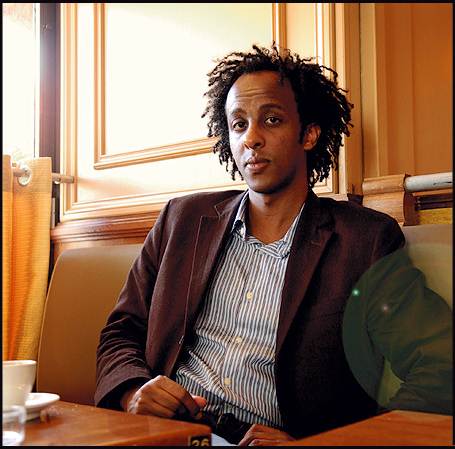 Although Dinaw Mengestu specifically represents an Ethiopian immigrant, he aims for his novel to speak beyond the Ethiopian experience to the experience of all African immigrants, whom he sardonically dubs the “children of the revolution” after the 1972 hit single by the British glam-rock group T. Rex. (And Children of the Revolution is the title of the British edition of Mengestu’s novel.) His two best friends are Ken from Kenya and Joe from Congo, and the conversations these three men have about their relationship to their homelands is both bitter and humorous. One of their games is to see who can recount the most correct information about a revolution in Africa and to joke about which dictator was the most ruthless and extravagant. Sepha’s two friends represent two different possibilities of the immigrant experience. Ken represents the successful immigrant who becomes an engineer, imitates the behavior of “highly effective people,” internalizes the ethos of America capitalism, and has no desire to return to Africa. But his material success is emotionally hollow, which is why he spends so much of his free time drinking whiskey with Sepha and Joe and hoping for the success of Sepha’s store. Joe is the opposite – a man full of nostalgia for his homeland, who imagines himself writing a great poem about the failed revolution of Patrice Lumumba in the Congo, but who still works as a waiter in a posh D.C. restaurant ironically named the Colonial Grill. To keep from collapsing emotionally under the weight of his own self-perceived failure, he puts on a professorial air to sustain his dream of going to graduate school. Between the two polar opposites of Ken and Joe, Sepha struggles to find his own identity. Mengestu has composed an elegant and wonderful novel, but it is not without its flaws. It is curious to note how many white American reviewers have praised the novel for its truth and for accurately capturing the immigrant experience and the immigrant voice – as if these reviewers would know. What these reviewers miss (from lack of knowledge) are the many moments where the novel feels wrong or contrived. The most glaring example of this is the main character’s aloneness. While it is possible that a solitary immigrant might run a store, most stores are run by families or extended networks. Mengestu’s contrived plot requires his main character to be an existential “man alone” figuring things out for himself. This is a classic American story-line, so it’s not surprising that the novel would appeal to the American critics and other writers who in fact praise the novel precisely for “portraying the isolation… of immigrant life,” but this kind of aloneness is not the typical experience of immigrants, who tend to be very connected to family, church or mosque, and other institutions of their ethnic community. Indeed, managing a store by oneself is a near-impossible task, so Sepha’s situation is far from usual, and most Oromo and Habesha readers will be struck by the fact that there are no other Ethiopian characters in the novel. We might contrast Mengestu’s portrait of the immigrant store-owner to the much more probable account in Chang-rae Lee’s Native Speaker, published in 1995 by the same press as Mengestu’s novel. In Lee’s novel, Korean families are part of a business network called a ggeh, and the archetypal “mom and pop” stores actually have both a mom and a pop, not to mention children and maybe a cousin or two helping out. Likewise, Paule Marshall’s classic novel Brown Girl Brownstones (published in 1959) beautifully describes a vibrant immigrant community from Barbados now living in Brooklyn, New York during the Great Depression and World War II. In Marshall’s story, we see a variety of Barbadian characters, not just one person. In it, a young girl becomes a strong woman as she struggles to define her own identity in relation to family and friends. Strangely, in Mengestu’s novel, we never see any other Ethiopians around, even though D.C. is world-famous for its many Ethiopian restaurants just a couple blocks from Sepha’s store in Logan’s Circle. It is almost impossible to walk around that neighborhood without running into somebody from Ethiopia and having to give a head nod and feeling obliged to mumble “Salaam” or some other Amharic expression – an action of politeness that most Oromo perform with feelings of obligation, kindness, and comfort as well as antipathy and bitterness. Although in several interviews Dinaw Mengestu has claimed he got the idea for his novel one day when he walked into a convenience store and saw a dejected-looking man all alone, it doesn’t seem like Mengestu did much research on how such stores actually get managed. This figure of the solitary store owner seems to be a literary shortcut for evoking the crushing aloneness that all immigrants sometimes feel, but does not accurately represent what actually goes on within immigrant communities or within an individual’s soul. At some moments the novel seems to be less about a real store owner and more about the author’s own experience in the creative writing program at Columbia University where one actually would be the lone immigrant, where one actually would be constantly reading the same European literary classics that Sepha is always reading, where one actually would be hanging around university professors, and where one actually would be constantly doubting oneself. There is a bit of fantasy in Sepha’s character; he is the kind of person that the white American and British literary community wish all immigrants were – witty, amusing, and cosmopolitan, but always alone and politically detached – instead of a real person whose wit has been dulled by hours of tedious work and who might be far too involved in his own community to have time to drink wine with bored university professors. The novel further flatters its white readership by attaching so much significance to the failure of his relationship with a white woman. This romantic failure is not only the center of the plot, but also becomes the symbolic catalyst for the failure of his business. All things considered, the novel’s plot is plausible, but not probable. So, ironically, it is precisely the aspects of the novel most praised by the white American media for being true that are furthest from the truth, and we must ask ourselves why white Americans appreciate novels about isolated, politically disaffected immigrants rather than novels about politically active, community-centered immigrants. Most of the readers of Ogina are politically, religiously, or culturally active individuals who feel some responsibility for each other and for the improvement of the Oromo people, but where is the novel about that story? What is also missing from this novel about the “children of the revolution” is any real attempt to understand those revolutions. Ken and Joe joke about it, but we as readers learn almost nothing about the historical realities of their homelands. Sepha remembers his father’s beating, but we get very little sense of time and place. Sepha’s memory of this horrible event is described in vague, dream-like terms, and its vagueness and imprecision is highlighted by how contrastingly precise and gorgeous is the detail with which Mengestu describes downtown D.C. We can understand that Mengestu was only two years old when he left Ethiopia and wouldn’t himself have the knowledge to reconstruct a historically meaningful scene, but we expect novelists to do a bit of research. In addition, if Mengestu is willing to claim in an interview that his name is meant to be a bridge between the Oromo and Amhara cultures, why does he ignore the existence of the Oromo in his novel? And if the weight of the past is so powerful for the characters, why does he avoid really dealing with that past? We might contrast Mengestu’s novel with the award-winning memoir Notes from a Hyena’s Belly by Nega Mezlekia, published in 2000, that deliberately explores that history in some depth. Although Mezlekia is also Amhara, his memoir is remarkably critical of his own ethnicity’s treatment of the Oromo and Somali. In addition, we might question Mengestu for never acknowledging the role of European empires and American multinational corporations in shaping Ethiopian society as the documentary film Black Gold did in 2006, a year before his novel was published. (That movie and transnational Oromo activism both in America and in Ethiopia for fair-trade coffee were discussed in an earlier Ogina article here.) We are left wondering what a novel might look like that addresses the true ethnic complexity inside of Ethiopia, the long history of oppression in the Horn of Africa, and the complicity of European and American governments in that oppression. We can’t expect an artist’s first novel to do everything that we want it to do, and we ought to appreciate all the brilliant things it does do. Mengestu is an excellent and serious writer, and he is an inspiration to the next generation of Africans in Diaspora who struggle to find their voice. Though we are critical of the novels faults, we strongly recommend it. We hope that it might inspire young Oromo talent to write a novel that does do all of the things that Mengestu’s novel fails to do. Steven W. Thomas is an assistant professor of English literature at The College of St. Benedict and St. John's University in Minnesota. He has published scholarly articles on eighteenth-century literature and on twenty-first century globalization. He also writes a blog about cultural theory.